You can find Chaat stalls on the streets of India just about anywhere. Chaat, a common form of street food which varies by region, is snacks served on a small plate or bowl often made of dried banana leaves. 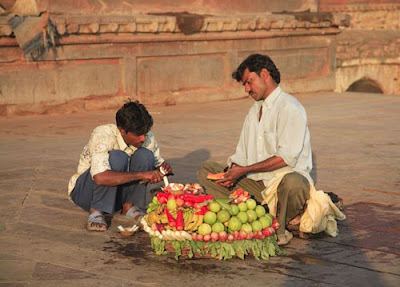 These two had set up business outside the main entrance of the defunct city of Fatehpur Sikri. The artfully arranged mix of fruit and vegetables were sprinkled with chaat masala (a blend of spices) and freshly squeezed lemon juice. when do we get to see the day of the dead photos!!!!!! See the thing that concerns me is the sanitary situation. There is clearly no running water and the food is rather too close to the ground for my liking. hi..visiting you and read your nice blog and i like your nice picture and have nice day..
Matt, you crack me up. Got back Monday night and promise to post them soon. Deb Hobo, Street food is often the most fresh. Lakshmi, I like it as well. Evanh, Thank you and hope you come back often. The taste of masala they pour on chat.